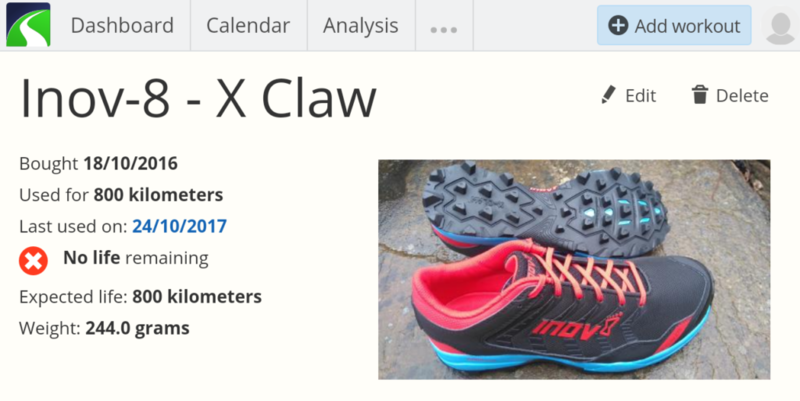 My Inov-8 X Claw 275 fell shoes have just clocked up 500 miles – how are they doing? Whilst it’s good to review kit straight out of the box it’s also really useful (probably more useful) to know how it stands up to the wear and tear of everyday use. I usually expect to get at least 500 miles out of a pair of fell shoes depending on the type of shoe and the type of terrain that I use them for. So how have the X Claws stood up? warning – no life remaining! My training diary warned me last week that after almost exactly a year the shoes had reached the end of their expected life, the picture of the shiny new shoes reminding me of how they used to look! The X Claws were my go to training shoe last winter and into spring and I have just started to wear them again after their summer break. They were also my race shoe for tough winter races such as the Trigger and the High Peak Marathon and I wore them for several recces of both races. 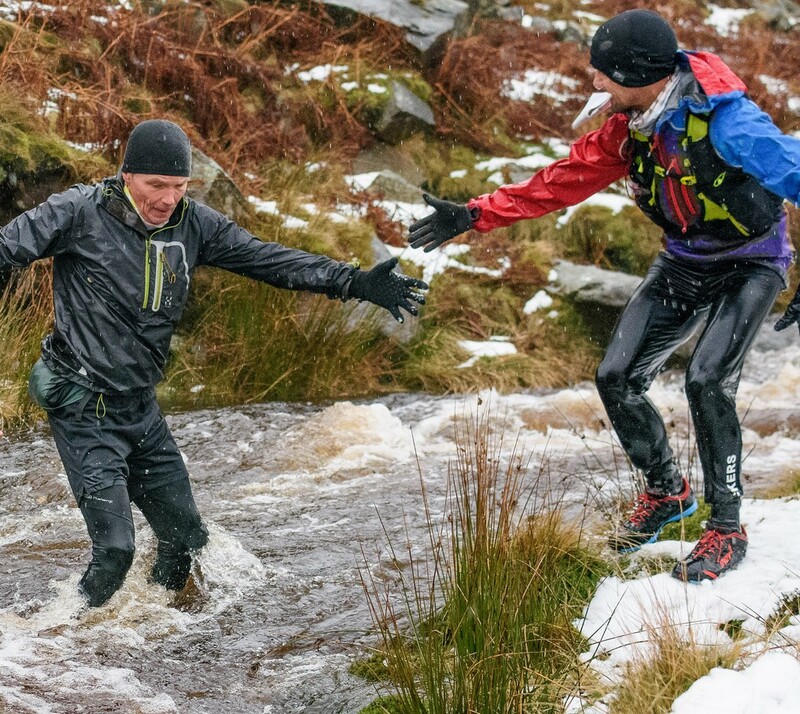 As such they spent much of the time soaking wet and covered in acidic, peaty mud and having to cope with the rough gritstone and abrasive heather of the Peak District uplands. I also wore them whilst supporting on the Charlie Ramsay Round in Scotland which included a couple of rough, scree sections which are always tough on shoes. As might be expected the harsh conditions have taken their toll and it is the uppers on the X Claws that have suffered the most. The outer layer of the upper has worn away in places, particularly on the instep, revealing a softer material beneath. This has led to the shoes becoming much less water resistant. In order to eke out a bit more mileage I applied some Shoe Goo to the worst affected areas! The rest of the uppers including the stitching have stood up pretty well with just a small area of wear on one heel cup. Although there has been some wear on the studs there is still plenty of life left in them. 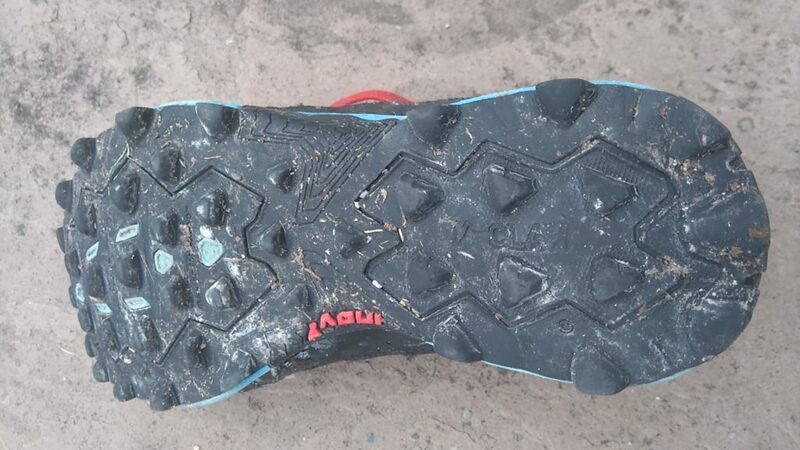 I tend not to wear out the studs on my shoes, a benefit of being light and in this case due to the fact that most of the miles covered have been on soft ground. The X Claws have lasted pretty well considering the harsh conditions in which they’ve been used. 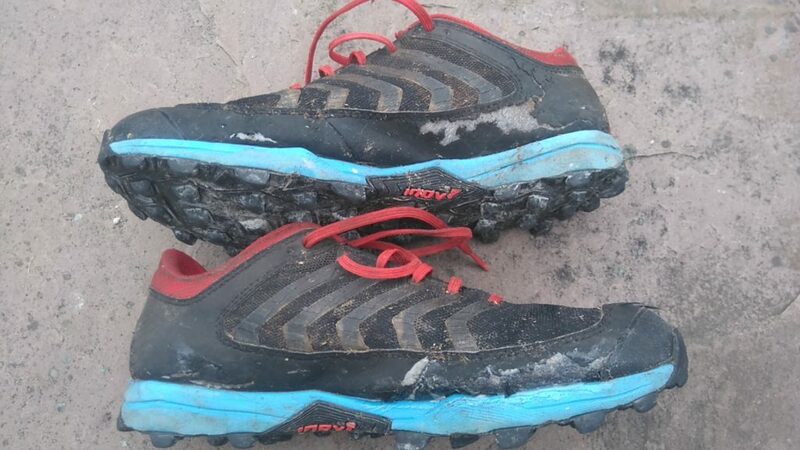 I have had shoes that have done more mileage before showing similar wear and tear, but they haven’t been used in the same type of terrain. 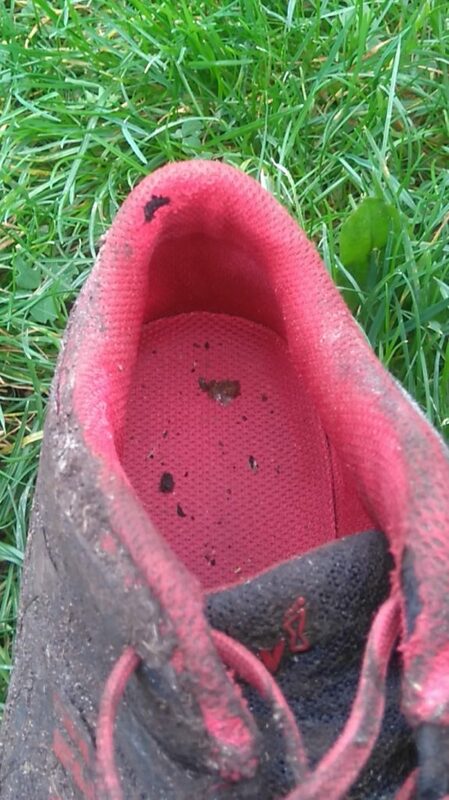 They have been almost constantly wet and muddy and to be honest I haven’t always washed them after use – does anyone? The shoes aren’t totally knackered just yet and I reckon I will get another couple of month’s wear out of them although I’ll probably relegate them to training rather than racing. tough life being a fell shoe! 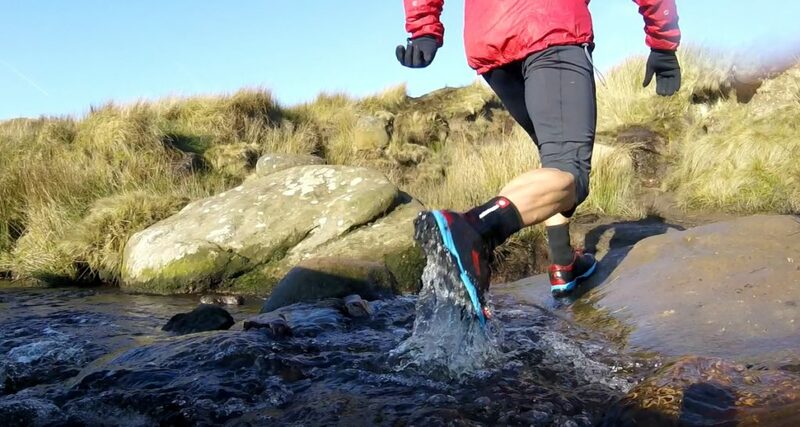 Posted in Reviews, Shoes and tagged fell running shoes, inov-8, X-Claw 275. Interesting read, especially as I hit 500 miles in my Terraclaw 250s this week. Mine are in good nick – I have a new pair ready to go but they’ll be staying in the box for a while yet I think. Cheers James. Got a pair of Terraclaw 250s too. They’ve done about 700 miles and have just about had it. Hi Dave, thanks for writing this and your other articles. 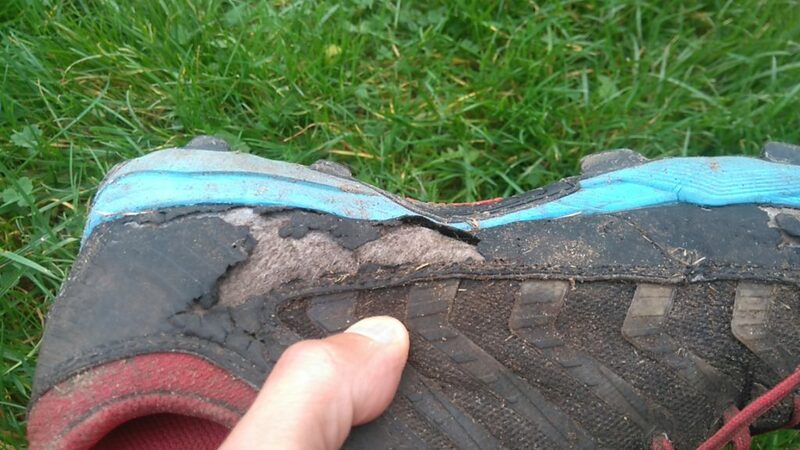 I will soon be buying a new pair of trail shoes. I will be running the kintyre way ultra in May next year. I’d imagine my training will involve hills/hard packed paths and muddy terrain. Do you think these would be suffice? I’ve previously used salamon speed cross for trail and hill. Although the grip on the speedcross has been good, I’m possibly looking for a trail shoe with slightly more cushioning on the sole. I think the X Claws might be too aggressive for the hard packed paths. I’d go for something like the Roclite 305 which are a bit more suited to all round terrain. However I’m not sure if they give any more cushioning than the Speedcross.